1 Child Killed, 3 Injured In Coral Springs School Bus Crash | Schuler, Halvorson, Weisser, Zoeller & Overbeck P.A. 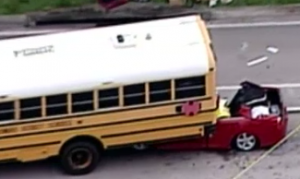 Broward County school officials and witnesses say one child was killed and three others were injured after their school bus crashed in Coral Springs. The Broward County school district and the Florida Highway Patrol officials says a bus carrying 42 students from Hillsboro Beach had crashed. Aerial video showed the bus lying on its side in a ditch with its rear half showing scorch marks. The Florida Highway Patrol say a power line struck by the bus ignited the fire, but the exact cause of the wreck remains under investigation. Civilians joined the Florida Highway Patrol officials and fire crews to rescue the children. Florida Highway Patrol officials say one student was dead at the scene. The child wasn’t identified. Three students, the bus driver and three officers were taken to different hospitals in Broward County with non-life-threatening injuries. The 38 other students were returned to the school where counselors met them and their families. The Florida Highway Patrol officials said they are still trying to determine if the accident was caused by either drugs or alcohol. No charges have been filled yet, according to The Post.